I started wood turning at secondary school and have continued on and (mostly) off for well over 40 years. When I started to look forward to some well earned retirement I decided to get back into wood turning as a new, long term hobby. Most of the equipment needed requires a high initial outlay, but fortunately, it has a long life span. For all the right economic reasons, I decided to re-start the hobby while I was still at work so that I would be able to get all the goodies I would eventually need. Like lots of hobbies, you can always have bigger and better toys, but for now, I have got more than enough to get me started. During the initial stages of my new hobby I installed all the equipment in my workshop (that's a posh name for a shed) which measures no more than 7 foot by 5 foot. Within that area I had a Nova DVR lathe, a dust extractor, a small bench, and various shelves and cupboards in which to store all the bits and pieces. In October 2007 I had 2 days training with Nick Arnull, a professional wood turner based in Norfolk, and I immediately felt at ease with the hobby. Thanks Nick, you started a real hornet's nest in my life. 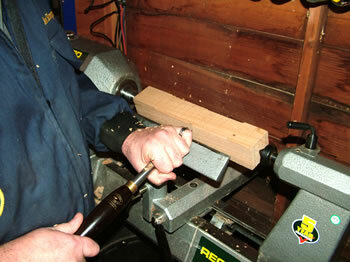 Prior to this I had not held a turning tool since before I left school. 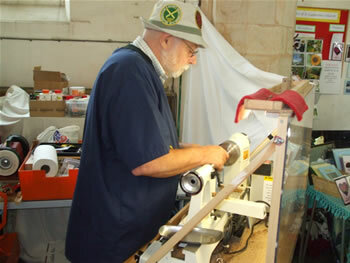 Early in 2008 I had a few unexpected problems with my Nova lathe, and although the problems were eventually resolved, I felt less than comfortable with the situation and this led to several major changes taking place. 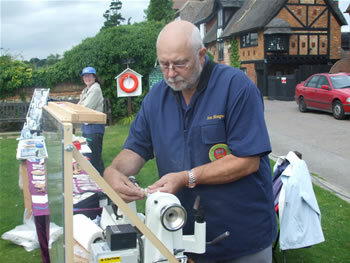 Whist I was at Woodex '08 I ordered a new Vicmarc 175, and the old lathe was sold as soon as it was in good order. Also, a new, sealed workshop was built into the front half of the garage, which resulted in the most important person in my life getting her shed back (an added bonus). These changes have made a huge difference in how I feel about my turning. 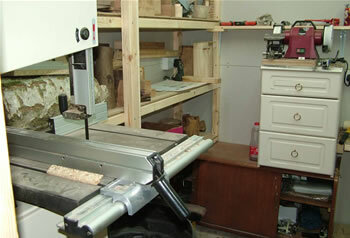 In particular, the Vicmarc lathe has given me so much confidence, allowing me to move on with the hobby. From 2008 my skills were fine tuned and extended in all sorts of directions by Colin Hovland, a fellow turner who has in excess of 30 years experience. I realise that much of what I am doing is trial and error, but in spite of that, I am proud of the work I have completed to date, much of which can be seen on other pages on this web site. In mid 2010 my wife and I took the bold decision to 'up sticks' and move house. Those that know us well will say "What, Again!". 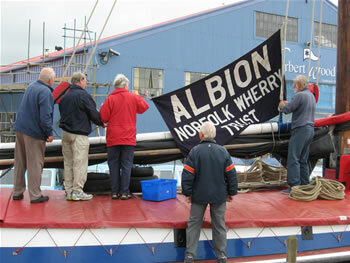 We have had a life-long attraction to Norfolk, and we concluded that it is either now or never. So, the old house was sold, the workshop was stripped down and packed up, and in January 2011 it was all re-built at our new address in Ludham which is about mid-way between Norwich and Great Yarmouth. 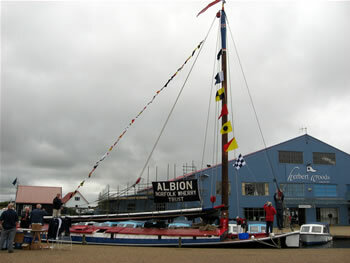 We are well settled now, and the move is going to have a noticeable effect on the work I do for the Norfolk Wherry Trust, for which I managed to raise over £800 in 2010 and £2300 in 2011, all from the sale of turned souvenirs. A second, smaller lathe is now on order, this will let me get out and about, showing off my skills at craft fairs and the like. Life in Norfolk is great. The new workshop is up and running, and very soon after moving here I became a member of my local woodturning club, The Norwich Woodturners, who meet on the first Friday of the month. Over the last few years I have come to realise that my interest in writing about woodturning is just as important to me as the actual turning itself. 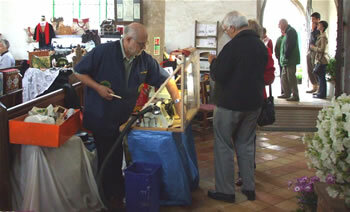 This led to me becoming the newsletter editor for Norwich Woodturners. 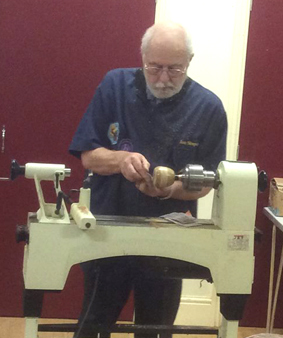 In 2015 we moved to the Broadland Woodturning Club, and in 2016 I was voted in as club secretary. 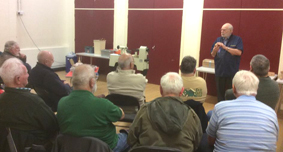 As active members, lots of plans were considered to help the club grow a little, and a major achievement was to get the club relocated into the more central, village hall. As you can see, retired life can get quite hectic, and just once in a while, I wish I was back at work, at least then you can take the odd day off. A regular thing with Bron and me is our annual trip to Saundersfoot in South Wales. 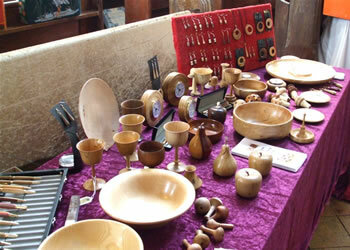 For us, it is normally the first holiday of the year, and is a really good chance to catch up with our friends at Pembrokeshire Woodturners. This is a small club that meets on the second Thursday of the month, and if you are ever in the area, pay them a visit, they are a really friendly bunch. We have visited this club many times, and now it is a regular occurrance that on the second Thursday in March I do the evening demonstration. I made a segmented apple from Oak and Ash, which went down very well and afterwards, quite a few members came forward and said how much they had enjoyed the evening. For most turners, that is reward enough. The real highlight of the evening came when Bron and I were invited to become "Honourable Members" of the Pembrokeshire Woodturning Club. A very nice touch guys (and gals), thanks very much, and if we can be of any asistance, we will do what we can to help, inspite of the 400 miles between us. Since moving to Ludham in 2010 my wife and I have been warmly welcomed into the parish and we are increasingly getting involved in many local activities. So much so that in 2013, I decided to offer my services to the community and took over as editor of the Ludham Parish News, a monthly challenge which I enjoy enourmosly. You can download previous issues of the 'Ludham Parish News' here. 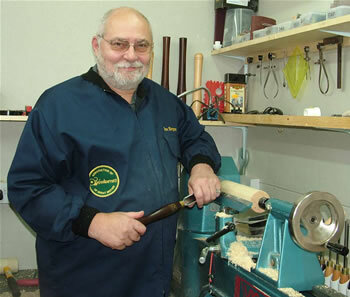 The latest event of any significance is the purchase of a new lathe from those nice people down in Axminster. I have wanted something a bit bigger for a while now, and I happened to spot a JET 1642 on a well known auction site. It was a perfect, fully tested, unwanted customer return which had been deemed not suitable for purpose. Having got it for well under the list price in January 2016, I await its delivery with anticipation. Life is busy, and there is always something to be getting on with. How on earth I ever had time to go to work I will never know. Long term, I would like to gain the skills to allow me to derive some income from the hobby, so, all that you see on these pages can be purchased, and all contacts and ideas I get will be followed up with great interest. As a guide, prices start at less than a fiver for a bottle stopper or a small bud vase, candle holders are around £9, goblets are between £20 and £40, and salad and fruit bowls will vary between £30 and £100 depending upon size. I am pleased to announce that I have been working with Archie and Sharon at the craft shop in Port Appin (near Oban in Scotland) for some time now. The range and quality of the craft goods they have on show is, in my opinion, second to none, and for that reason alone, I have decided to appoint them as the sole U.K. outlet for much of my work. On the right you can see one of a number of bowls that were sent to the Appin Craft Shop earlier in the year, most of which are now sold. Much more of my work will follow in the coming months. So if you are in the "Port Appin" area, please take time out to visit Archie and Sharon, you will be made very welcome, and you will have the opportunity to browse through and buy some of the best craft goods I have seen in a very long time. My wife and I spent the first weekend of May 2011 in our local church at Ludham. There we were taking part in the craft fair and supporting the village effort in whatever way we could. During the 3 days my wife put in a tireless effort on the sales table, whilst at the same time I was doing continuous demonstrations. By the time Monday night came round and we had packed up, we were about ready to drop, but it was worth it. 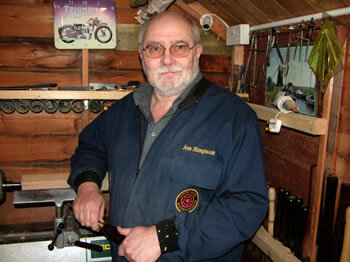 The most interesting question I had all weekend was (about the lathe), "is it electric" ! The last weekend of May we went to visit the church at Potter Heigham where plant sales and a craft event were being advertised. In we walked as visitors, and after a very short conversation with the organiser we found that one of the tables was in use for the Saturday only, and would be vacant for the Sunday and Monday. So, here we go again, we were invited to attend a 2 day event with well over 5 hours notice before we had to set up late on the Saturday afternoon. Again, a great time was had and the church fund was able to benefit. The most interesting query raised at this event turned out to be "Could I make 6 capping rings to fit round the port holes on a boat". Whilst at the Potter Heigham craft fair in late May I was offered a very old piece of timber from St. Nicholas Church, a round towered, thatched Church dating back to the 11th Century. The original beam, of which this picture shows a very small part, came from the 15th Century improvements to the West End of the North Aisle roof. The timber has mostly been eaten by some form of beetle, so it is most certainly, a holy piece of wood. 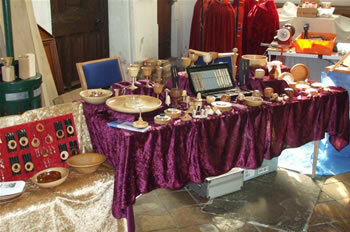 In a similar way to my wherry activities, I used some of the timber to generate much needed funds for the church. Here, a picture of the first pen made clearly shows a worm hole (aka "a feature") filled with resin. In June I attended the Ludham Open Gardens event. A total of 12 local gardens were open to the public on a day that you would normally expect to be hot and dry. This year was the exception, it was cold and wet. In spite of that, the visitor numbers were acceptable. In my area minor tree surgery was required to let the wherry get along side the garden. 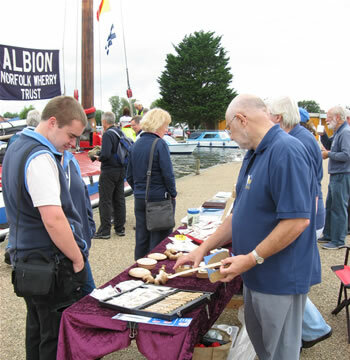 Here, several members of the Norfolk Wherry Trust were working together, all in support of the trust, and valuable funds were raised. For me, the highlight of the day was when I came to appreciate several facts, i.e., it was wet, there was thunder rolling around, I was working in a metal framed gazebo, under a tree, and I had live mains electric to let me do some turning. Now I understand why she that matters was checking that the payments on my insurance policies were up-to-date. 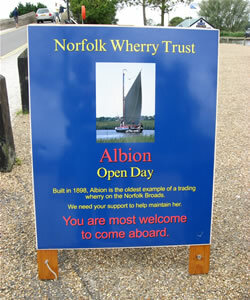 In August 2011 the annual Wherry Albion open days came and went in quick succession. On these days the public can have a free guided tour of the wherry and talk to past and present crew members to learn about the boat and "the ways of the wherrymen". 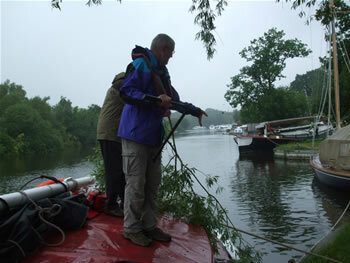 On Friday 12th August the boat was next to the bridge at Potter Heigham (see above) where the day started cold and a bit damp. For the first hour or so great care had to be taken with the turned souvenirs but fortunately the weather and visitor interest turned out to be quite good. 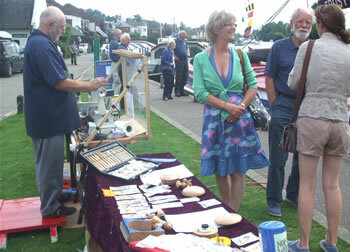 On Tuesday 16th August we were at Horning on the front of the village green (see above). 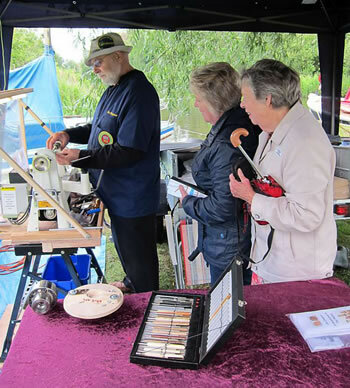 Here there is electric available on the river bank so I had the lathe running all day and was able to demonstrate to the visitors as well, always a good attraction. 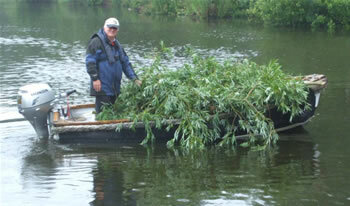 For Wednesday 17th August the boat had moved to Ranworth Broad. It was a really cold day, mainly because the boat mooring is always in the shade. In spite of that, a great day was had by all.